Joint Call to Action: July 2014 - Month against the Apartheid Wall! What followed has been another decade of injustice and continued impunity with a lack of accountability for unlawful Israeli actions. Ten years later, the Wall and its associated regime of settlements continue to grow in Palestine, embodying a massive instrument of land annexation, pillage of natural resources and displacement. The Wall marks the final brick in Israel’s apartheid project that defines the segregated enclaves to which the Palestinians are to be confined - a more cruel version of the Bantustans established by the former South African apartheid regime. Worldwide, Israel has succeeded in illustrating that walls are an acceptable model for governments to exclude, marginalize, dispossess, discriminate and segregate one people from each other. In the very moment that Israel has jeopardized the last round of over 20 years of failed talks, it is time for a ‘legal intifada’, an intensified popular struggle and more boycotts, divestment and sanctions. It is time for accountability. 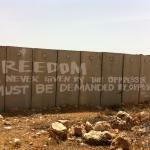 Make July the Month against the Apartheid Wall! - Pressure your government to respect its obligations as outlined in the ICJ decision. the maintenance of the situation created by it. This implies a clear call not to finance or otherwise support any activity related to the above. 3) For the international community to take effective action to end Israeli violations of international law, which may include sanctions. In Palestine, people have continued to resist the Wall with popular protests, court cases and direct actions. Exactly one year after the ICJ decision, Palestinian civil society called for a global campaign for boycotts, divestment and sanctions (BDS) in order to support our struggle for justice and liberation. We thank all those across the globe that have taken action to pressure their governments, institutions and corporations to enact the ICJ decision, and beyond this, to overcome Israeli apartheid, colonialism and occupation. We ask you to expand and deepen the global BDS movement for justice. Justice delayed is Justice denied! Stop the Wall Now! Boycott, Divestment and Sanctions Now! Center for Defense of Liberties and Civil Rights "Hurriyyat"